Kevin conducts a reading of his new nonfiction book, American Sweepstakes, in front of a capacity crowd at Gibson's bookstore. Kevin on the set of "My Deadly Little Secret." Kevin and Rebecca have become go-to expert commentators in the true crime community. Kevin & Rebecca have a great stash of true crime books. Why not pick one out of the lineup? Rebecca in the studio about to record her latest podcast, "Crime Writers On Serial." Although first conceived as a companion to the runaway true crime podcast "Serial," the panel (which includes Kevin) take on all kinds of topics dealing with real and fictional crime and with pop culture. Kevin have wine and cheese at the launch party for Our Little Secret. Despite what you might think, white wine is a better pairing for true crime. Kevin and Rebecca at a signing for Legally Dead in Keene, NH. A smiling face often gets book store shoppers to take a look - even if they were coming in to get Fifty Shades of Grey. Kevin and Rebecca hold a book discussion at the library in Tuftonboro, NH. Library crowds have some of the best questions. Kevin on the set of "Unusual Suspects," which adapted Our Little Secret into an episode. Kevin is with the actors who played teenaged Eric Windhurst and Melanie Paquette. Kevin doing a selected reading of Wicked Intentions at the Barnes and Noble in Holyoke, MA. Kevin & Rebecca are available for readings. Click this photo to get to their contact page. 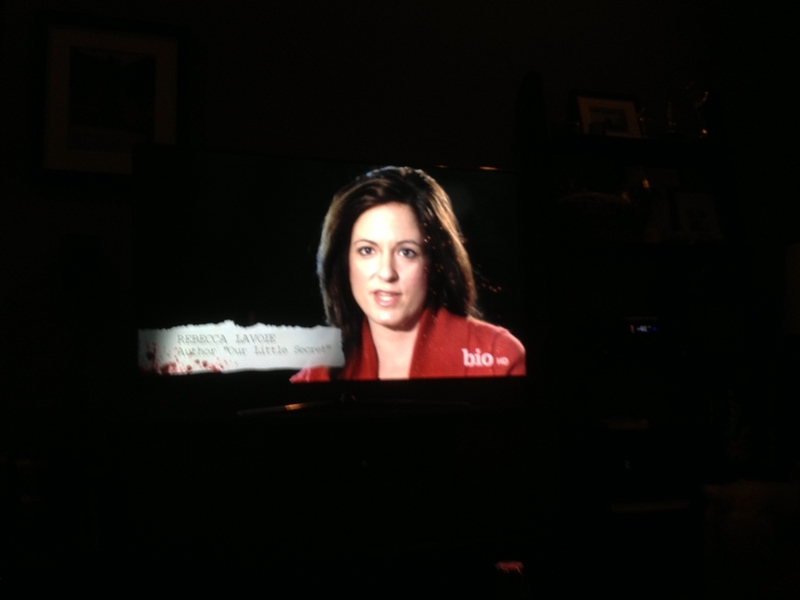 Rebecca appearing on the television show "Deadly Alibi." The couple have made a habit of turning up on a variety of true crime shows. Kevin making edits to the "first pass" on Notes on a Killing. While much of book writing happens at a computer, making edits and spotting typos often happens the old fashioned way. It is Kevin Flynn & Rebecca Lavoie, after all. Here's Kevin appearing solo at a book signing at the Barnes and Noble in Manchester, NH. It can get lonely without his partner, but it makes signing books quicker. Rebecca is reading an advance reader's copy of Megan Abbott's Dare Me. Megan, a NYT best-selling noir and crime writer, and Kevin & Rebecca are mutual fans. Megan has been a big supporter, providing a cover blurb for Notes on a Killing. Rebecca and Kevin doing a book discussion on Our Little Secret at Gibson's bookstore in Concord. Their style is less about reading and more about having a dialog with the audience. A full-page spread on Kevin and Rebecca in the Concord Monitor. The paper said "Notes on a Killing certainly won't disappoint devotees of its genre." Kevin and Rebecca doing a signing. Contrary to popular opinion, their autographs do not decrease the value of the books (drastically). Kevin at the New York offices of Penguin after the publication of Notes on a Killing. They may be a writing team of two...but an entire staff works to shape and promote every book. Kevin in New Orleans posing with his favorite author, David Simon. Before creating the acclaimed HBO show "The Wire," Simon wrote the best true crime book of his generation, Homicide: A Year on the Killing Streets (later made into an NBC drama). Mr. Simon does not seem as impressed with meeting Kevin as Kevin does meeting him. Kevin with Pulitzer Prize winner for The Brief Wondrous Life of Oscar Wao, Junot Diaz. Kevin reports the acclaimed author was "pretty cool." Kevin greeting NYT best-selling author Jodi Picoult, another New Hampshire writer with a slighter larger following. Kevin with National Book Award winner Sherman Alexie in Seattle. Alexie confessed that true crime is among his favorite genres to read when he's not writing (no word on if he's picked up a Flynn/Lavoie tome).